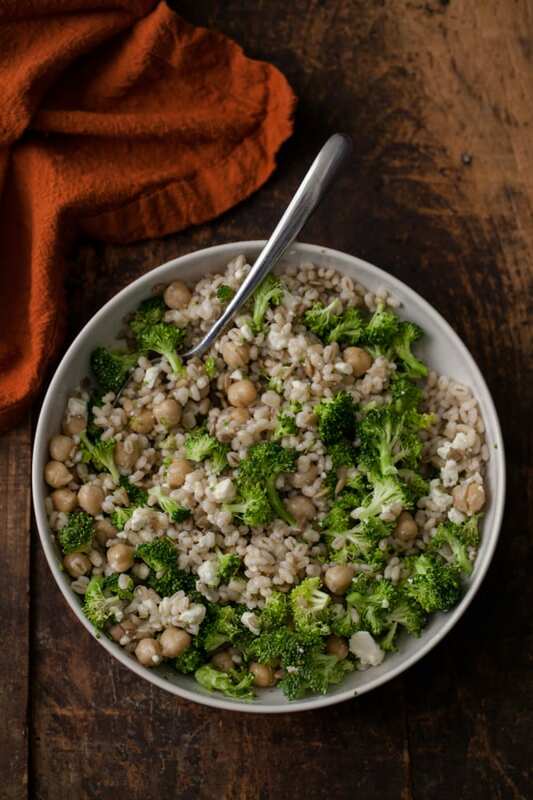 Broccoli Barley Bowl | Naturally. As of recent, I’ve not felt a whole lot like cooking. There’s been take-out pizza and random pulled together meals instead of thought-out dinners. Life has been a bit crazy. M and I have had some ups and downs with life choices but I’m hoping with a few key decisions made, we can move on and settle into a new, slightly more laid back routine that includes a nice cooked dinner, together. This bowl includes certain items I always have on hand. I highly recommend keeping the sunflower seeds for crunch, the chickpeas for protein, and the barley for a nutty flavor (but really, any grain will do.) 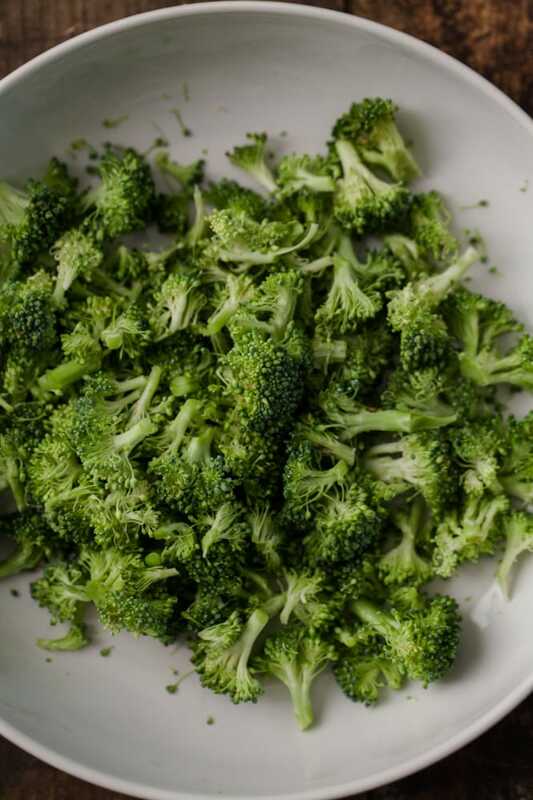 While I used raw broccoli, I do love roasted (maybe with a few onions or cauliflower thrown in.) During the fall months, I have plans for swapping in some roasted Brussels sprouts. 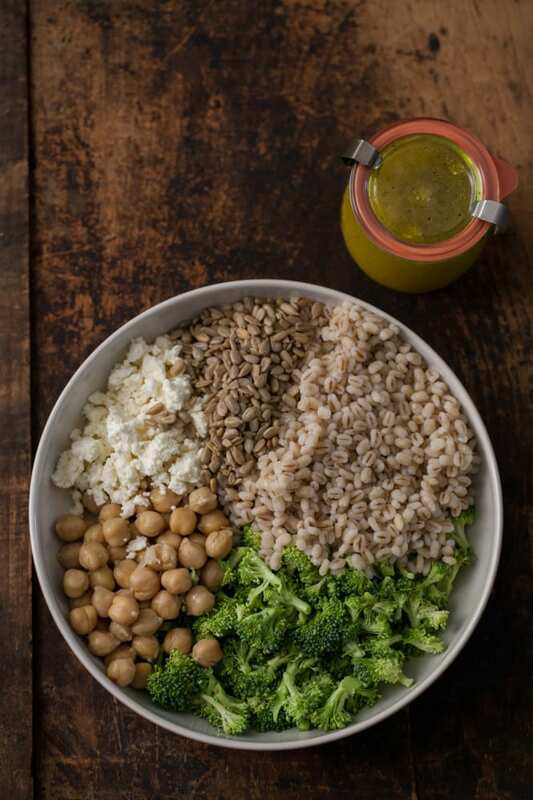 Combine ingredients for bowl. 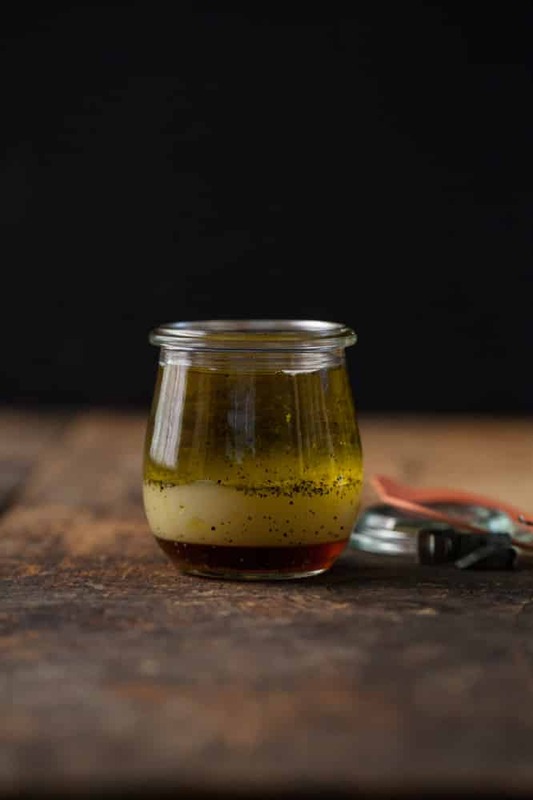 In a small jar with lid, shake dressing together. Pour over bowl and toss everything together. I’ve had a couple of periods like that recently (it’s kinda reassuring to know that I’m not the only person for whom life stress = pizza) but this is the sort of food that I know I should be eating instead. I love the idea of having this recipe in my back pocket for whenever I need something tasty + comforting but nutritious too. This looks so tasty Erin! 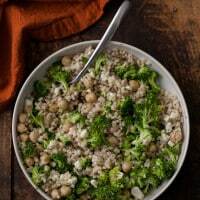 I love the slight chewy nuttiness barley brings and bowls are a lifesaver when you just want to put something easy together! It’s so nice to have a go-to sauce that helps you get through those nights when you want nothing but an easy meal. This looks great! love this recipe. thanks for sharing it! Lemon dressings are super versatile and this really is the perfect bowl meal with a little crunch, creaminess, chewiness and greens. Love it! This looks like such a great weeknight meal! Unfortunately, one of the few foods my boyfriend won’t touch is barley. (I made a delicious barley risotto once, and I thought that would change his mind, but alas, if that could not, nothing can!) What do you think would be the best grain substitute? Brown rice? I hear you with the life choices… and the hectic life. Life is going to get really crazy for us in the next few months, and I might be without a real kitchen for a little while – so I am cobbling together recipes like this that can be easily cobbled together with a rice cooker and don’t require too much cleanup, so that we can keep eating healthily and I keep cooking! Totally craving this for lunch! I’m allergic to sunflower seeds. What do you think would work well flavor-wise for a good crunch substitute… some carrots maybe? Or something a bit nuttier? Hey Pre, sorry for the delayed response (I was under the weather!) I think sliced almonds or pepitas would be great! I’m allergic to pumpkin seeds, too. I’ll try the almonds. Thanks! Hope you’re feeling better. I’ve never tried, but I have had leftovers the day after and it’s still good/flavorful!